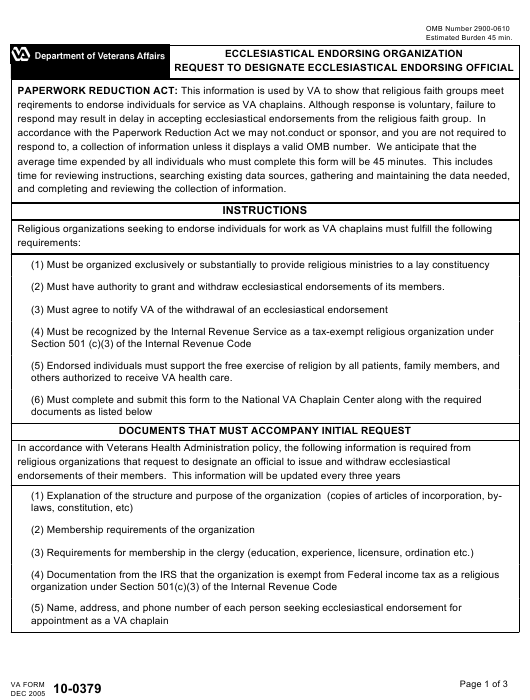 VA Form 10-0379 is a United States Department of Veterans Affairs form also known as the "Ecclesiastical Endorsing Organization Request To Designate Ecclesiastical Endorsing Official". The form was last revised on December 1, 2005 - download an up-to-date fillable PDF VA Form 10-0379 down below or find it on the Veterans Affairs Forms website. and completing and reviewing the collection of information. (2) Must have authority to grant and withdraw ecclesiastical endorsements of its members. others authorized to receive VA health care. MINISTRIES TO A LAY CONSTITUENCY? INDIVIDUALS TO SERVE AS VA CHAPLAINS? GRANT AND WITHDRAW ECCLESIASTICAL ENDORSEMENTS TO THE MILITARY? answers to the questions below. Service of the Department of Veterans Affairs.